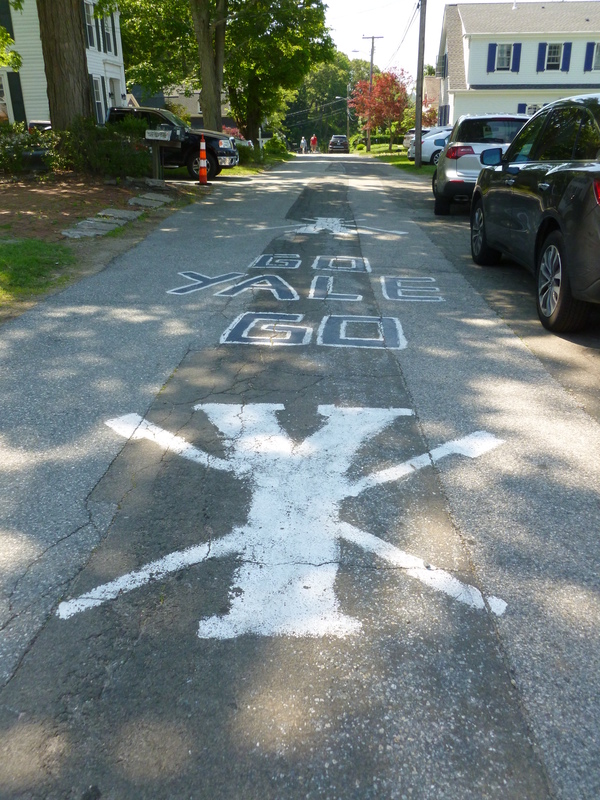 Go Yale – painted in the street outside Yale’s training quarters at Gales Ferry. Do you have a bucket list? 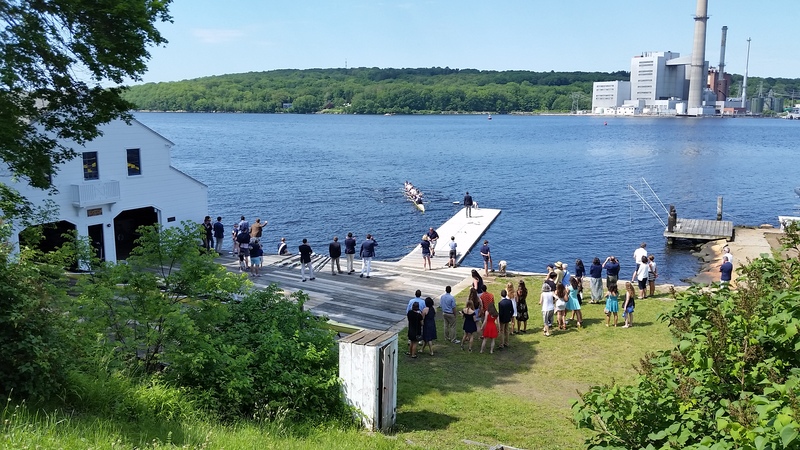 I don’t, but ever since I arrived on American soil on 2 August 2000, I’ve had one wish: to visit Yale rowing team’s training quarters at Gales Ferry, Ledyard, by the Thames River in Connecticut. Last Saturday, this ‘dream’ came true. The man who made it possible was the Buckhorn fairy godfather – or is he these days called a wand-waving ‘Harry Potter’? – Thomas Eliot* Weil, famous rowing historian and collector par excellence. 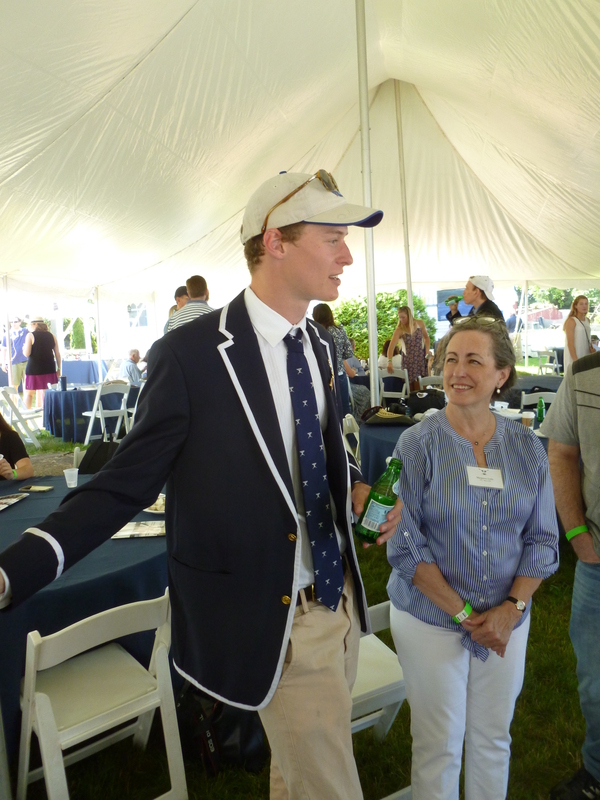 Tom rowed at Yale, of course, and for the 152nd Yale-Harvard Regatta he had graciously invited Mrs. B. and my humble self to Gales Ferry for a regatta brunch and an up-close look at the Bulldogs. 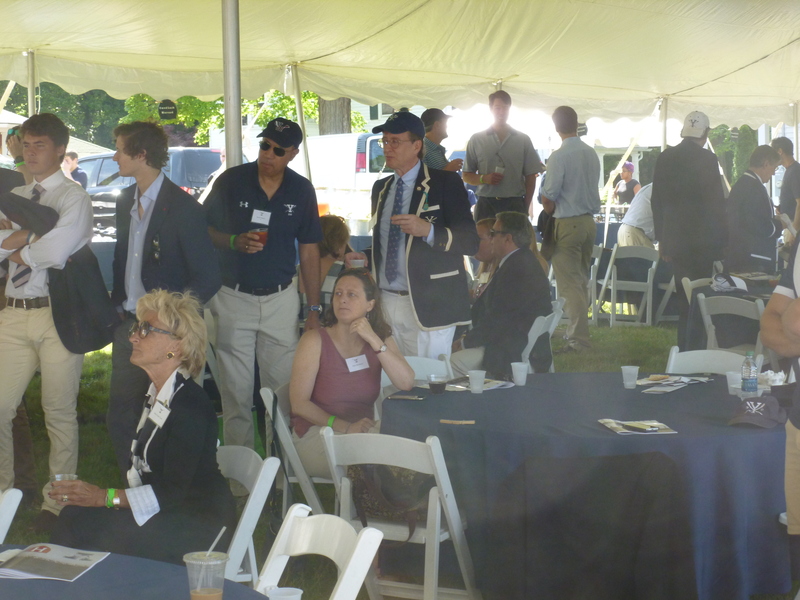 For, surely, after last year’s umpire faux pas when the Elis were robbed of the Sexton Cup, this would be the Yale crews’ year? 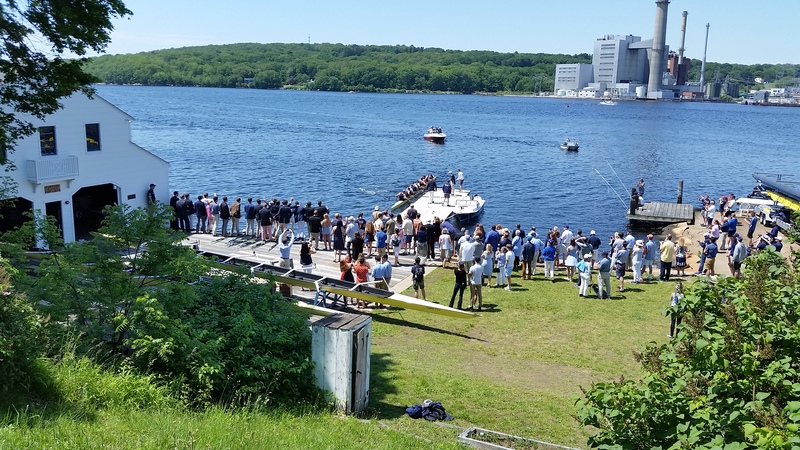 As you all know by now, all three Yale boats came out of Saturday’s racing as victors. The first clean sweep since 1996. Not only did the Bulldogs win, for Mrs. B. and yours truly it became a most wonderful experience with good company – it’s amazing how easy it is to make new friends when ‘your’ team is winning – nice food, great racing and marvelous weather. For Mrs. B. it was really special, as her family is chock full of Yalies. 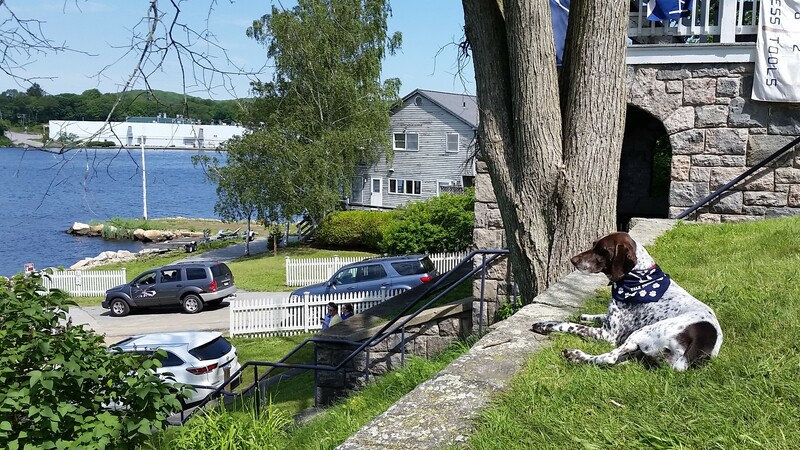 A dog waiting for a race. Will the ‘dogs’ win? 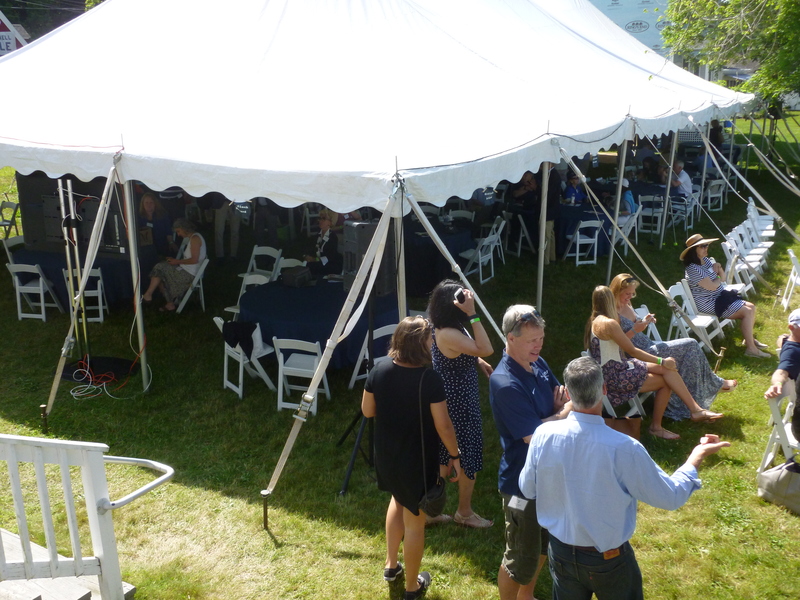 Big screens were put up for the Bulldogs alumni and their guests to watch the races in the dining tent, while outside the tent was a station serving brunch and also a bar. People relaxing in between the races. Outside the tent facing the river. View from the tent down to the river. 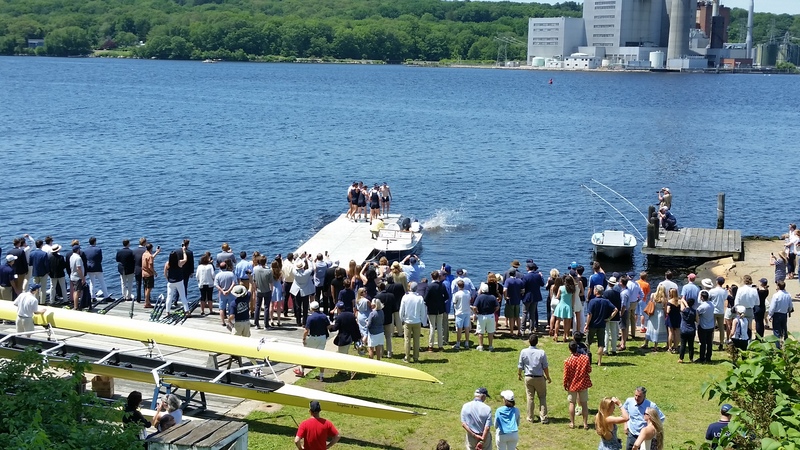 Yale 2nd Varsity coming in to the dock as winners. 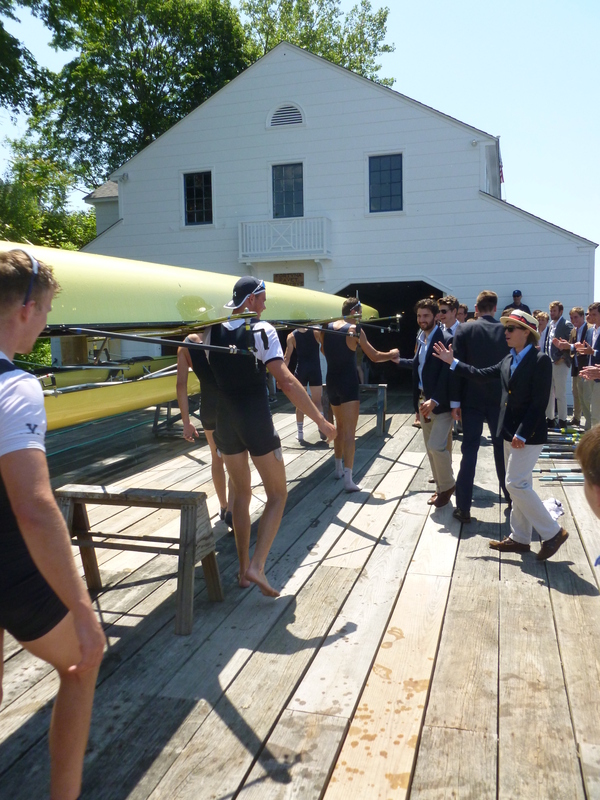 Yale Varsity at the dock. 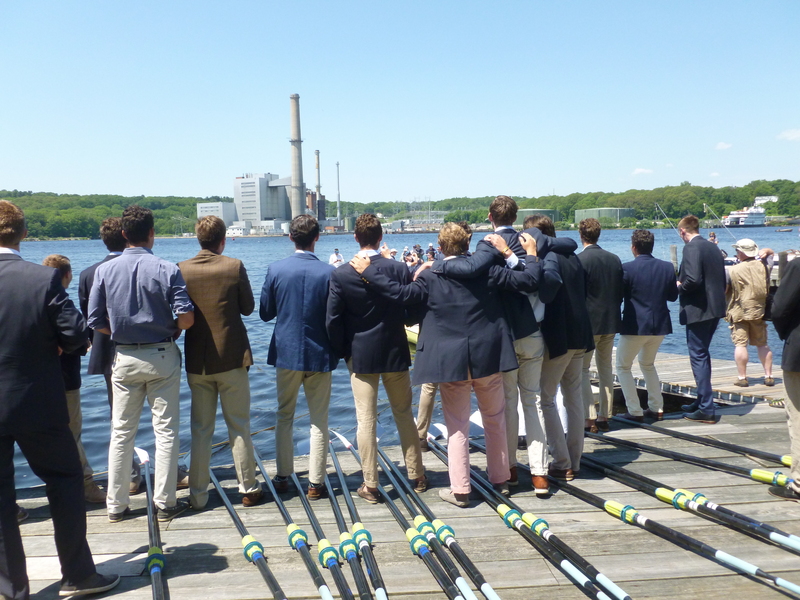 2nd and 3rd Varsity crews, properly dresses in blazers, waiting to greet the Varsity crew. 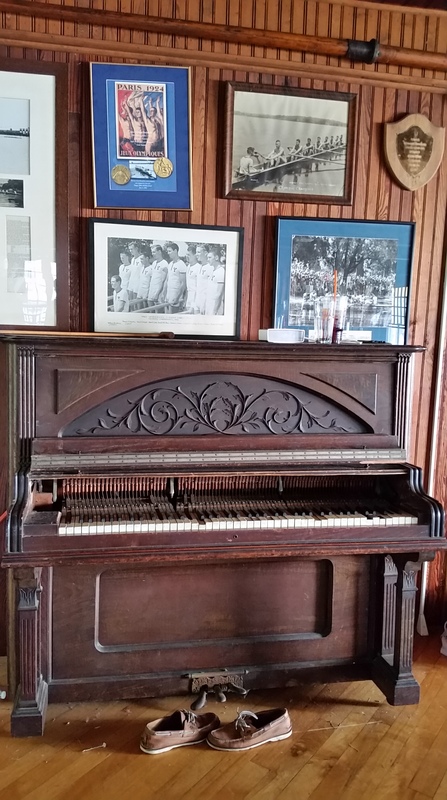 The loudspeakers in the boathouse is blasting “We are the Champions”. Coxswain Grant Louis hits the water. Victory shanty and some kind of dance at the dock. Victory hug for one of the winners. The victory boat “Class of 1983”. Yale training quarters looks like it needs a little paint job here and there. Flags reminding crews and visitors of glory of olden days. 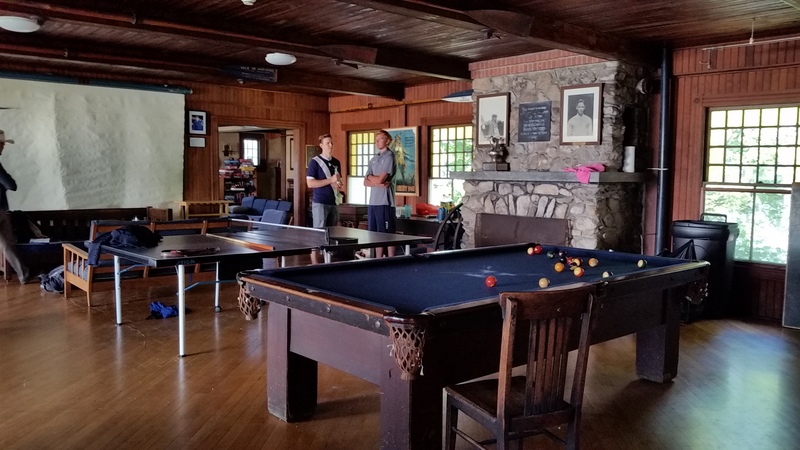 Walking through the door and you are in the Game Room. 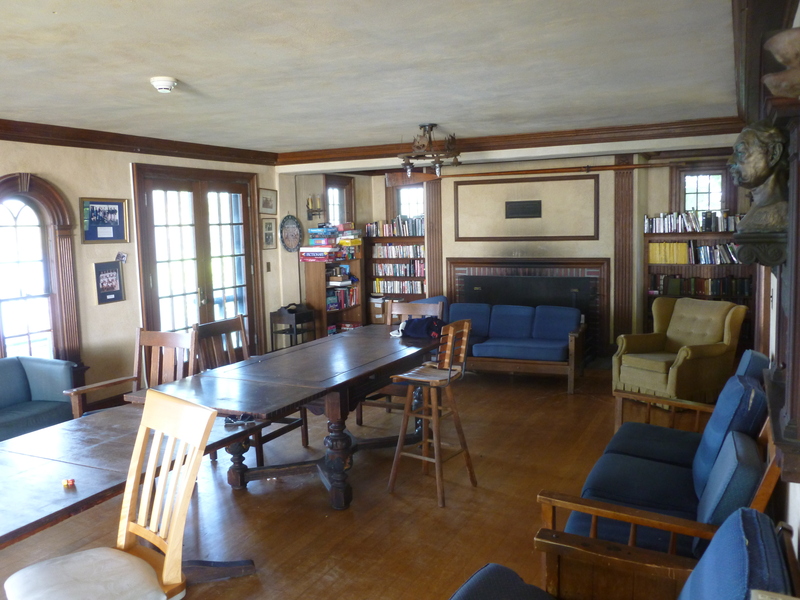 On the right from the Game Room is the Dining Room. 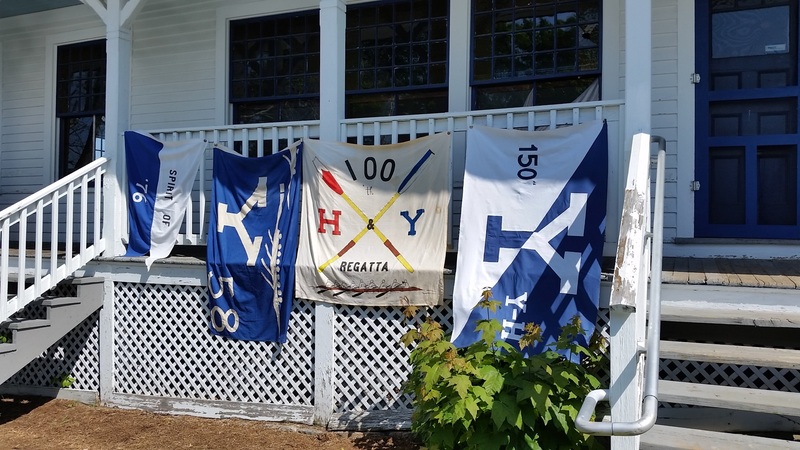 On the walls are Yale crews from the past. 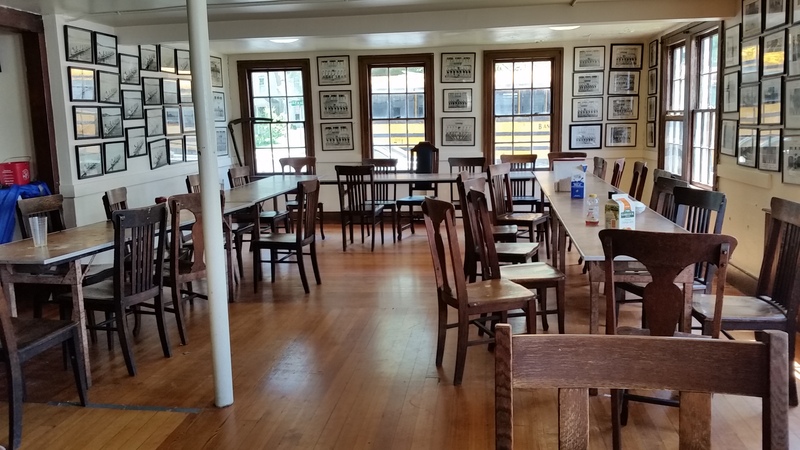 The rule was that no new pictures went up on the walls until a Yale crew had won. 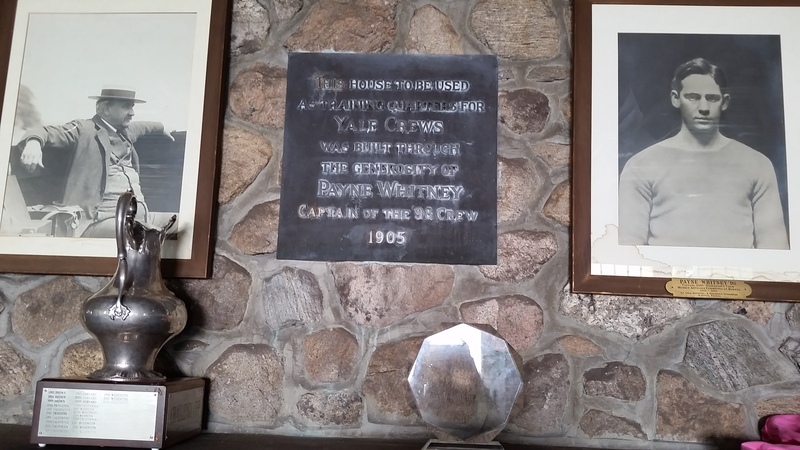 A memory plaque of Payne Whitney, Yale ’98, captain of the 1898 crew, who donated money to build these training quarters for the Yale crews in 1905. 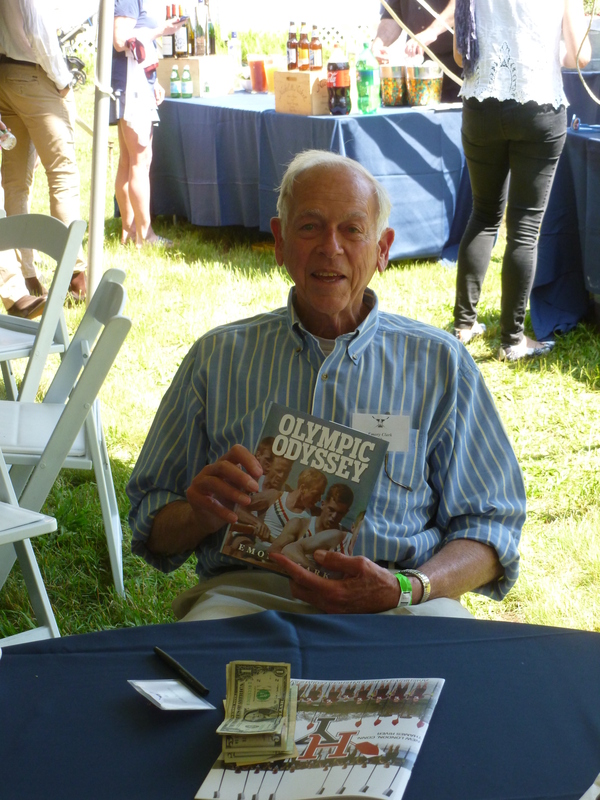 Emory Clark, Yale ’60, gold medallist in the eights at the 1964 Tokyo Olympic Games was at the Yale gathering this Saturday. He had brought with him a few copies of his beautiful book “Olympic Odyssey” (2014). The article writer was lucky to get a signed copy from the hands of the Olympic champion – a true gentleman. 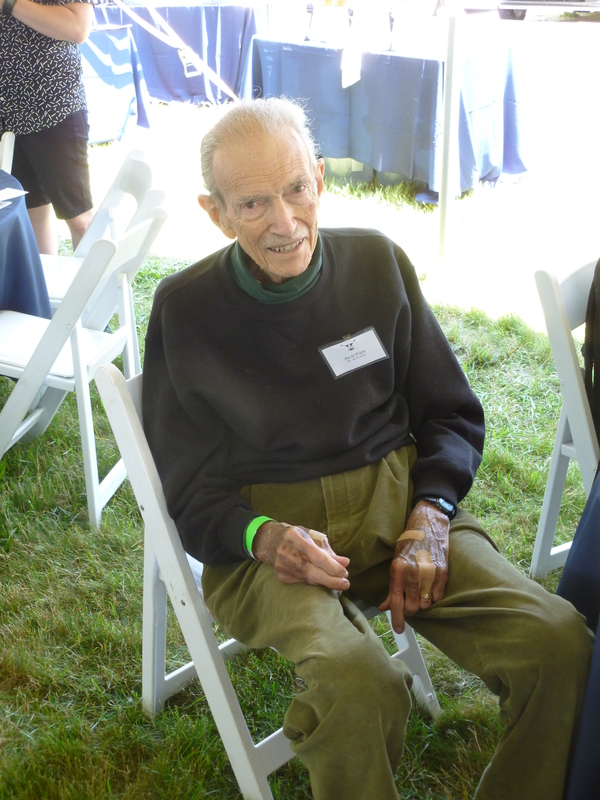 Another gentleman and Olympic rowing champion at Gales Ferry was David Wight, Yale ’56, who took a gold medal in the eights in the 1956 Olympics. 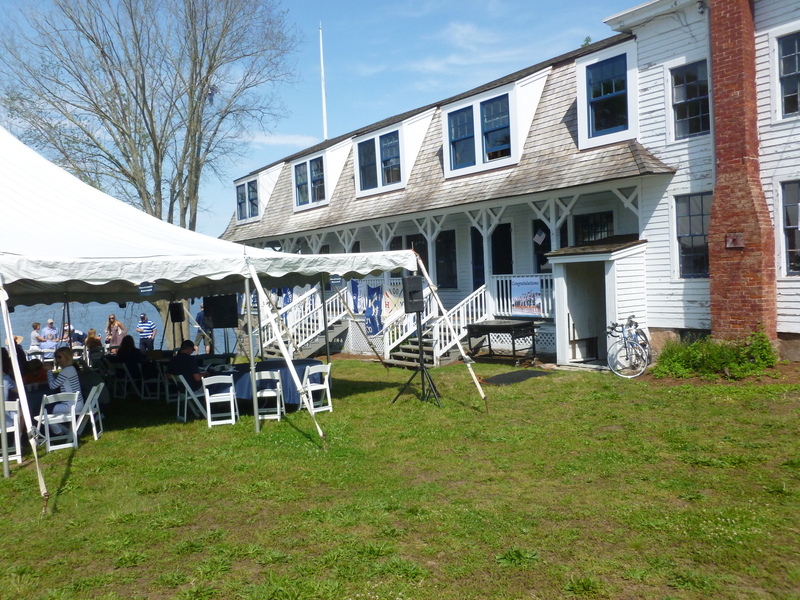 Last time, the article writer met Mr. Wight was in March 2008 at the Rowing History Forum held at Mystic Seaport in Mystic. A 2017 Yale hero, Robert ‘Rob’ Hurn, Yale ’17, a four-year first varsity veteran and captain of the Yale team. Hurn, from Brisbane, Australia, born in Glasgow, UK, is a two-time Sprints champion. However, after winning the last Eastern Sprints, Hurn went to Coach Steve Gladstone’s office and told him that he was not feeling well. A doctor diagnosed Hurn with Mononucleosis, and his season seemed to be over. 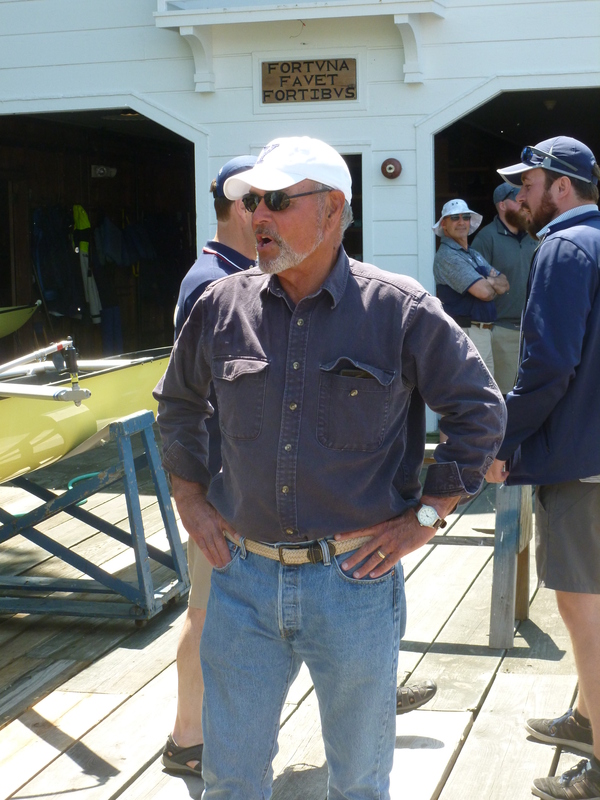 When Yale qualified for the final in the IRA Championship on Lake Natoma, Hurn wrote his team mates an e-mail in which he gave them advice and encouragement. 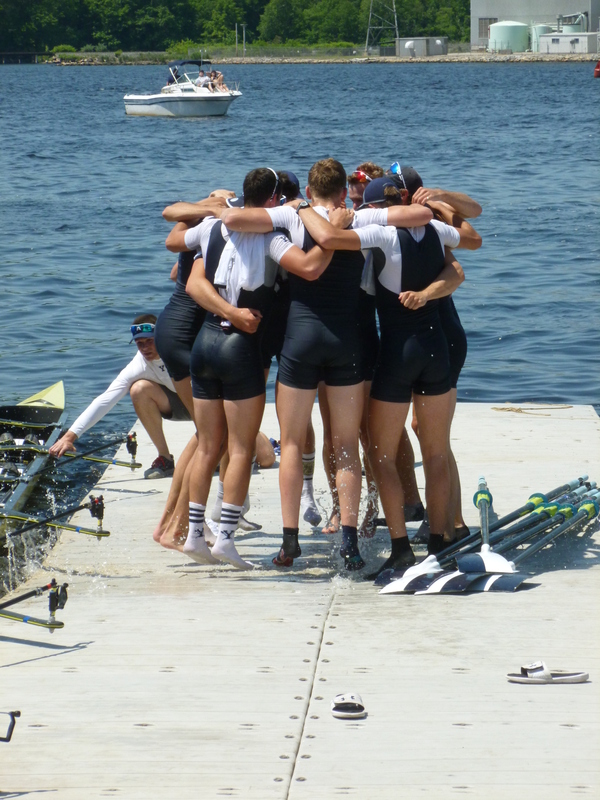 Coach Glastone told Row2k: ‘It was the most emotional thing I have ever read and it really touched everyone on the team.’ After Yale had crossed the finish line on Lake Natoma as National Champions, Gladstone called Hurn and said: ‘This was for you.’ Hurn gave Gladstone permission to share his e-mail with Row2k, an e-mail that ended: ‘Roll damn dogs.’ Read Row2k article and Hurn’s e-mail here. 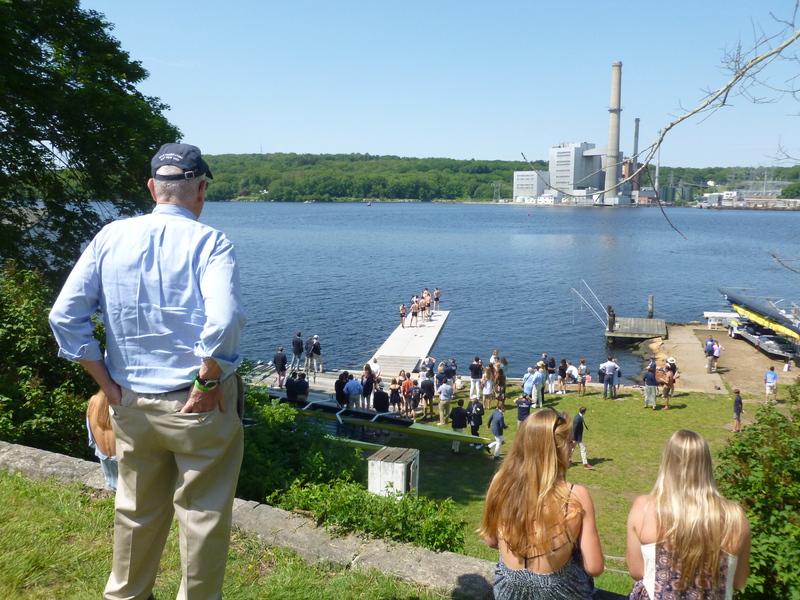 Rob Hurn, a physics major, rowed in the 2nd seat in the 3rd Varsity race on Saturday. He will soon be leaving for Cambridge to earn a master’s degree in nuclear engineering – and do some rowing. 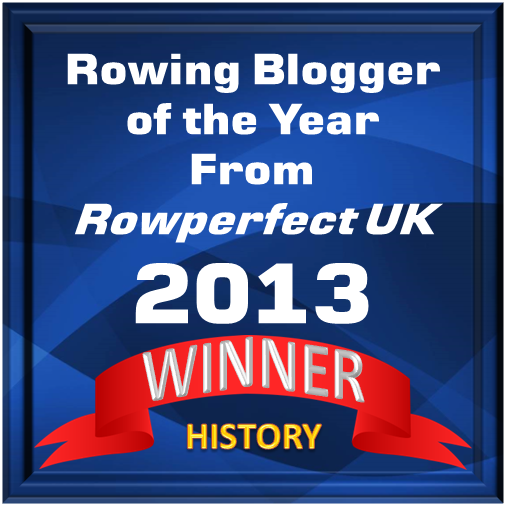 He is aiming to row for Great Britain at the 2020 Olympics. A happy Coach Gladstone. 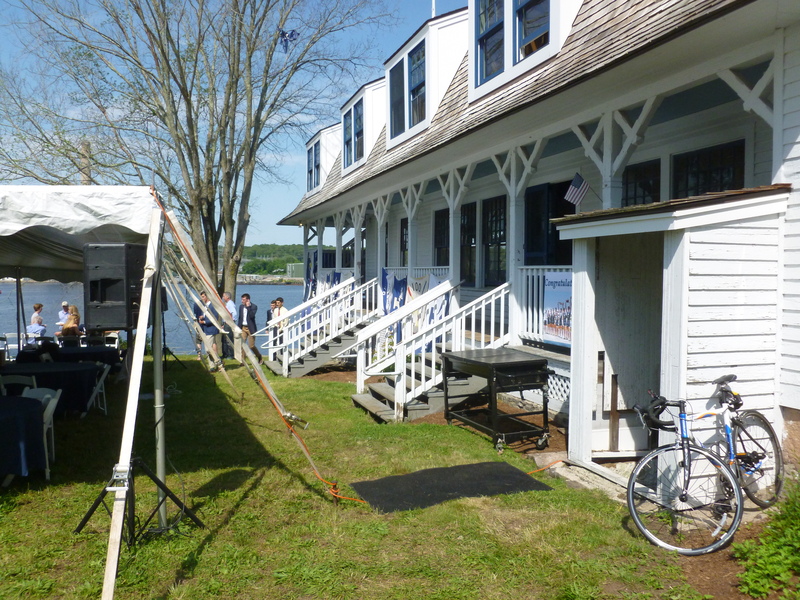 The sign on the boathouse reads: ‘Fortuna Favet Fortibus’ – Fortune Favours the Strong (or Brave). Two of Tom Weil’s friends whom Mrs. B. and I shared a table with. 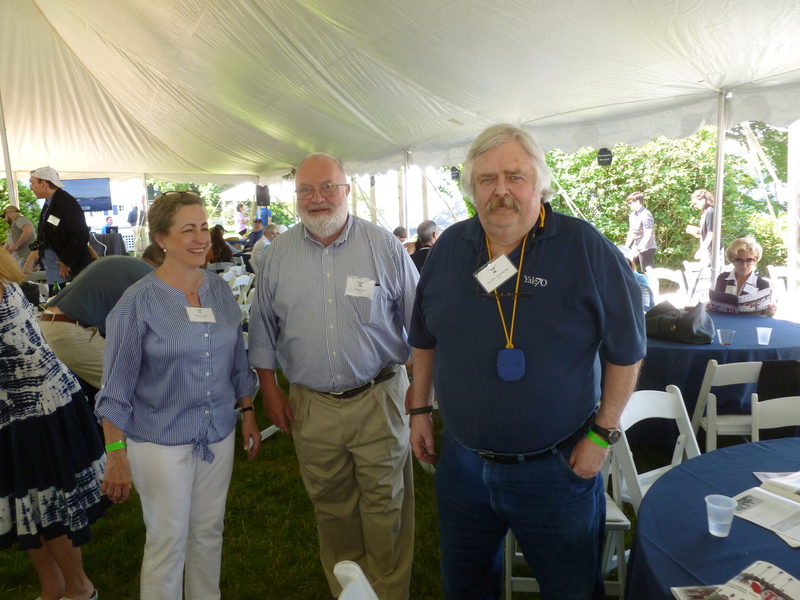 From left to right: Peggy Little, whose late husband, Roger ‘Skok’ Little, Yale ’70, was the coxswain and captain of the 1970 Yale heavyweight crew; Tom Weil, Yale ’70, famed rowing historian and collector, who kindly invited us for brunch at Gales Ferry; and Jon Eric Van Amringe, Yale ’70, who writes a couple of ‘Blue blogs’ or e-mailed newsletters for Yale lightweights, some for other Yale crews and some for Navy crews (as he coached at the Naval Academy as part of his U.S. Navy service). 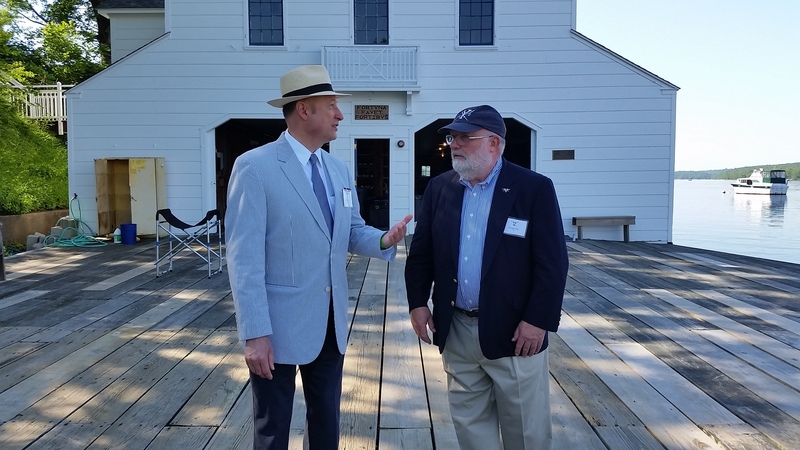 Two of the HTBS Team at Yale’s training quarters, Göran R Buckhorn (l) and Tom E. Weil. 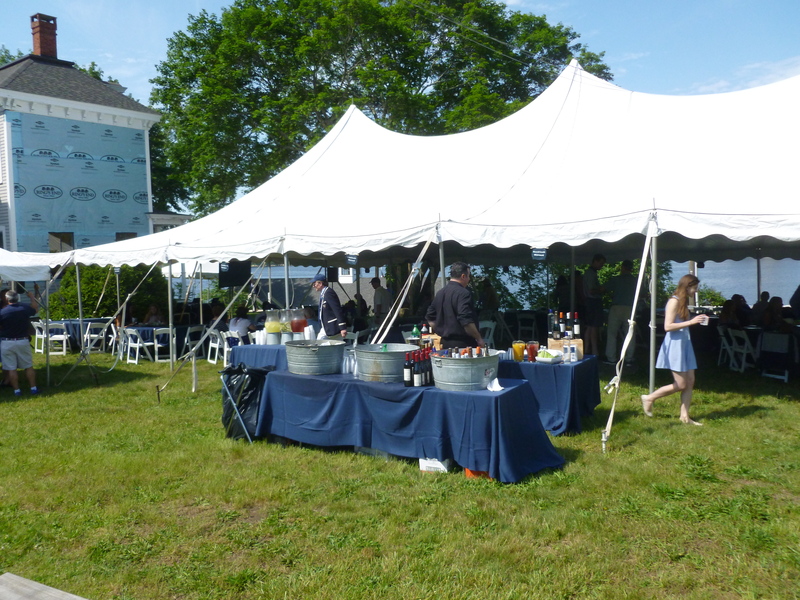 In the background, Yale Boathouse. *Yes, he is related to the poet T. S. Eliot! Photography Göran R Buckhorn and Mrs. B. An excellent piece, Goran. 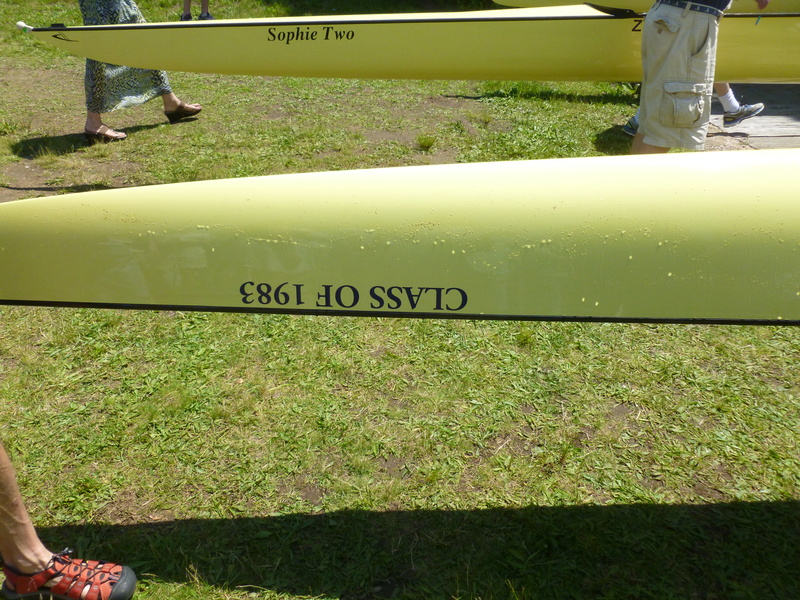 I have zilch connection with Yale but your words and photos conveyed that ‘ universal brotherhood of rowing ‘ that one recognises at and about any Boat Club gathering in the world.